Last weekend, after a little drive around Sirey Island to the east of Phuket town - where I finally got to see the reclining Buddha (the other times I have been there the temple had been closed) - we were heading home and I had half a mind to cook some pasta, but we passed a new looking noodle shop which looked interesting. Most noodle shops look the same, rather basic and cheap with plastic chairs and questionable hygiene (don't look too close - a good motto for Thailand!). 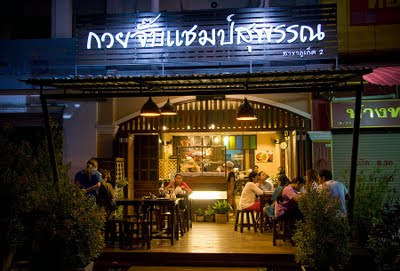 The Kuay Jap Champ Suphan noodle shop is in the Sam Kong area in the north of Phuket Town, just half a kilometer east of the Tesco Lotus store on the way into town. It has been open about 6 months they told us, somehow we'd not noticed before. 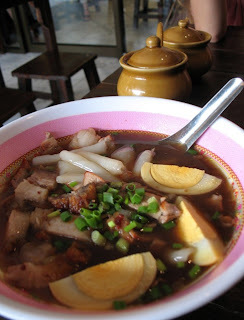 Or maybe we were in the mood for Kuay Jap which is a kind of noodle soup made with rolled up thick noodles, crispy pork, "moo daeng" (roast red pork) and (unless you ask them NOT to include it) things like liver, heart, intestines, congealed blood.. aka "offal". If you are an ex vegetarian like me, some meaty things are still considered inedible - so if you don't want all the bits, just say "Mai Sai Kruang Nai". This noodle shop makes an effort. 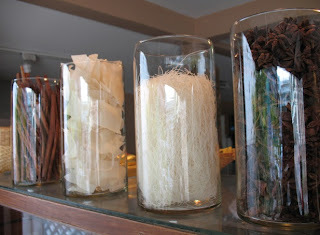 The place has a little style, the tables are wood, not plastic, there are decorations, and it is clean! This is no local backstreet noodle stall, it's much nicer and yet.. it's still cheap. We paid 210 Baht for 4 dishes and 5 drinks. I had a delicious Kuay Jap with the Moo Grob ("crispy pork") and the Moo Daeng plus some egg; my wife had the full monty with all the bits, and our kids had Khao Moo Daeng - red pork on rice with a kind of sauce/gravy. Very tasty. I do love a bit of moo grob! 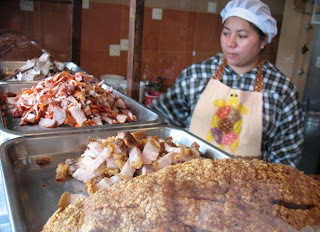 Crispy pork.. like porky scratchings/hog lumps in a soup. I think we will go again tomorrow! 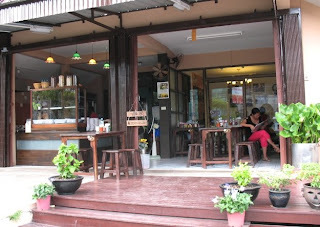 Update 2011 - they have opened a 2nd branch in Kathu, opposite the entrance road to the Prince of Songkhla University, we have tried this one too - just as tasty.. and it's close to our house. Bonus! 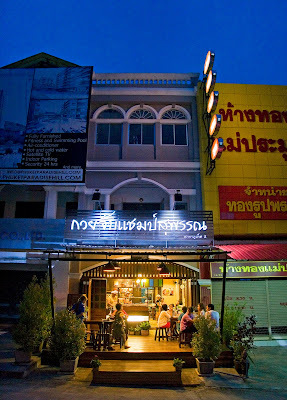 (above) Kuay Jap Champsuphan noodle shop in Kathu near the Prince of Songkhla University (PSU) - it's just a couple of hundred meters from another favourite local restaurant of ours called The Big Chicken. 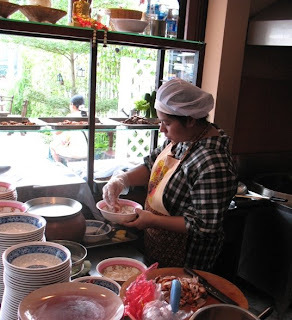 It's much easier to find good local food when you are not in a tourist area! 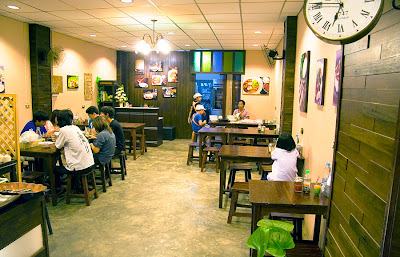 Update 2015 - The original location at Sam Kong is now closed. The one in Kathu is still there.